For generations the family farm has been the backbone of our economy. Today, in most of our rural communities, less than 10% of our families are totally dependent on agriculture. I will fight for fair treatment for farm families. Rules and Regulations are crippling rural Ireland and I will continue to oppose the ever-increasing sets of laws which make life more difficult. The EU and successive Irish governments have failed to address our problems. Rules on slurry spreading, environmental designation, Turf-cutting, One-off houses, Fencing and land improvements all have a disproportionate impact on the small farmer. EU regulation adds to escalating costs and poses a serious threat to the viability of family farms. 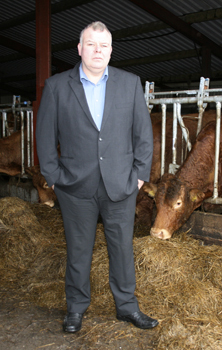 Cattle prices in Ireland are currently €250 per animal below those in the UK. We need to re-open the Live Export market and create farmer-owned co-ops to break the monopoly of the Beef Barons. Equally, sheep farmers need to be listened to as proposals at the moment will wipe out the Hill farmer. In spite of the fact that our farmers are not being properly rewarded for producing an excellent product our consumers are still paying ‘top-dollar’ for their meat. We must strive to become self-sufficient by growing our own food as far as possible. Installation aid should be reintroduced for all young farmers as they take over the family farm. A tiered farm support system is required to target proportionately higher payments towards small farms. The situation where the bulk of CAP payments are paid to the wealthy cannot be allowed to persist. Dairying is the buzz-word of the moment but I would urge caution. Farmers must examine carefully if their farm can remain sustainable if there is heavy borrowing or if the market suddenly changes. Historically, it has been shown that when there is a substantial increase in the production of a raw material, there is likely to be a fall in unit prices.